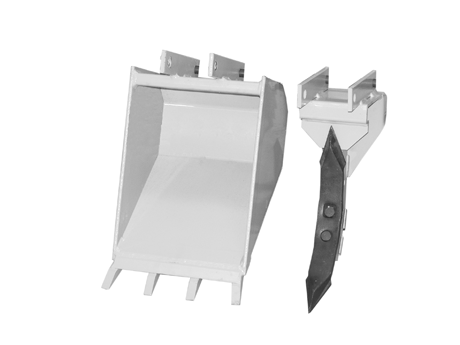 Heavy-duty single tooth ripper with two replaceable teeth: (1) 16” x 2” x 1/2” thick “plow steel” tooth for stone & frost picking & hardpan penetration to 18”; the other 15” x 2” x 1/2” thick serrated edge tooth allows root cutting to depths of 18”. Mounts in place of Bucket on Backhoe. Does not include the B612 bucket, (Far left) also shown in picture. Requires: D106, D1060 or D1065 Backhoe.